Last week we launched the new SiteStorePro.com website and while we were rolling it out, one of our designers asked how many different site designs we have had over the last 10+ years? (The answer was 6 …including the new design which we launched on May 6th ). We then started discussing how much has changed in web-design and Internet technologies over the last decade. Since so much has changed, not only in the Site Store Pro shopping cart features but also with our own website, we decided it would be fun to compare our older site design’s to where we are now. Well… retrospectively reviewing the evolution of SiteStorePro.com’s design history was not only quite emotional for those of us who have been here since the beginning, but it was also quite an enlightening experience. Reliving all five previous site designs showed us that, although we have made many mistakes and missteps, we can truly appreciate how much we have learned over the last 10+ years. “Ahhhh… I miss that one…”. For all of you that have been with us since the beginning (thank you! ), this will be a nostalgic journey into the history of Site Store Pro. 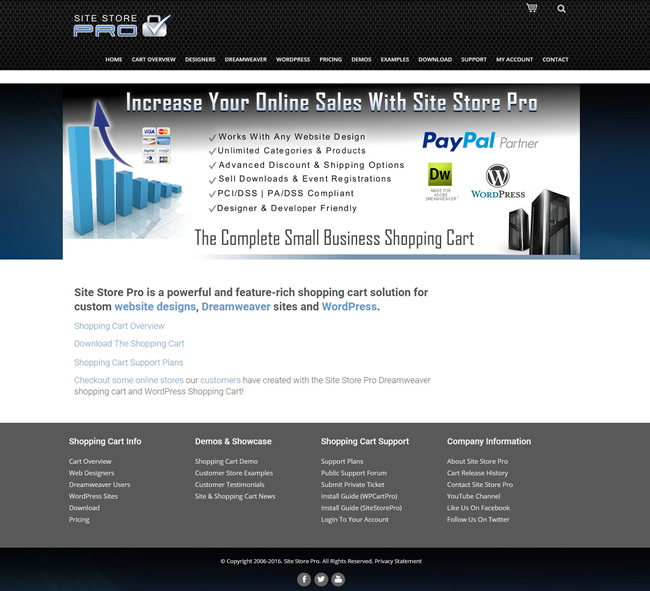 To everyone else who appreciates how web technology changes… take a walk down web-design memory lane with the evolution of SiteStorePro.com. The site width of the original site was fixed at 765 pixels! Our “second” site was another Dreamweaver design that used a CSS menu system but the site was still table-based. This version was universally disliked by everybody since the menus were not that friendly, the content was cluttered and disorganized and the site text was general too small and hard to read. Live and learn! This site was a drastic style change from the original SiteStorePro.com as well as a departure from our original corporate color scheme. We also stopped using “Site Store Professional” and shortened it to Site Store Pro on the website and in most of our help documentation. The site width was fixed at 950 pixels. 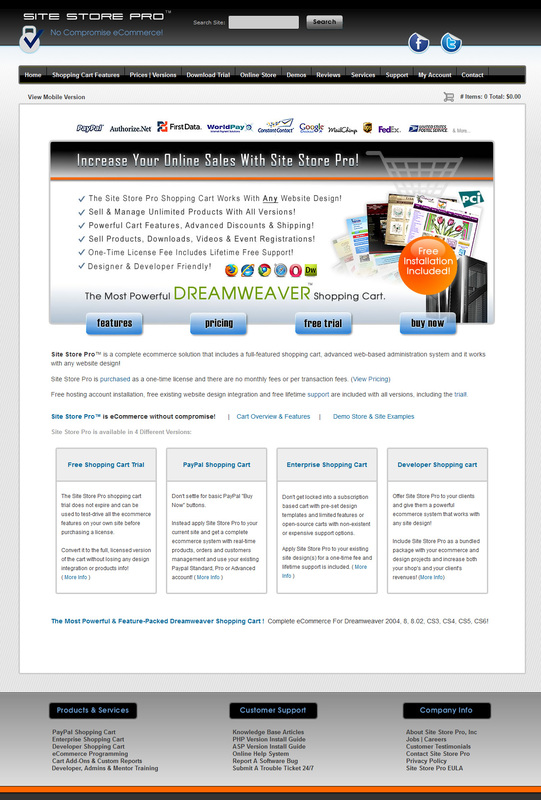 Our “third” Dreamweaver-based SiteStorePro.com design. This version was not table-based (finally) and used CSS (divs) throughout. This was not a responsive site however since the mobile version of the site were unique pages. (User was redirected to a mobile-friendly version of the page when viewed on mobile devices). After abandoning the orange highlights from our original branding color scheme in version “2” of the site, we brought that back in version “3”. The desktop site was fixed at 1000 pixels. Mobile version of the pages were fluid (100% width of device). 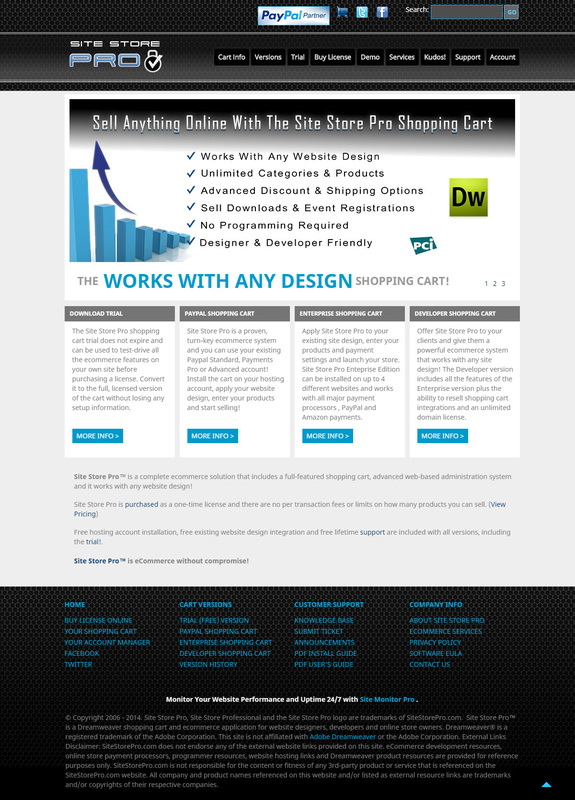 Our “fourth” and final Dreamweaver based SiteStorePro.com site design. This design was fully responsive and used the same CSS responsive layout that was later released to the public as the sample store responsive design. (The same layout/CSS that is currently in the Dreamweaver and Designer carts.) . 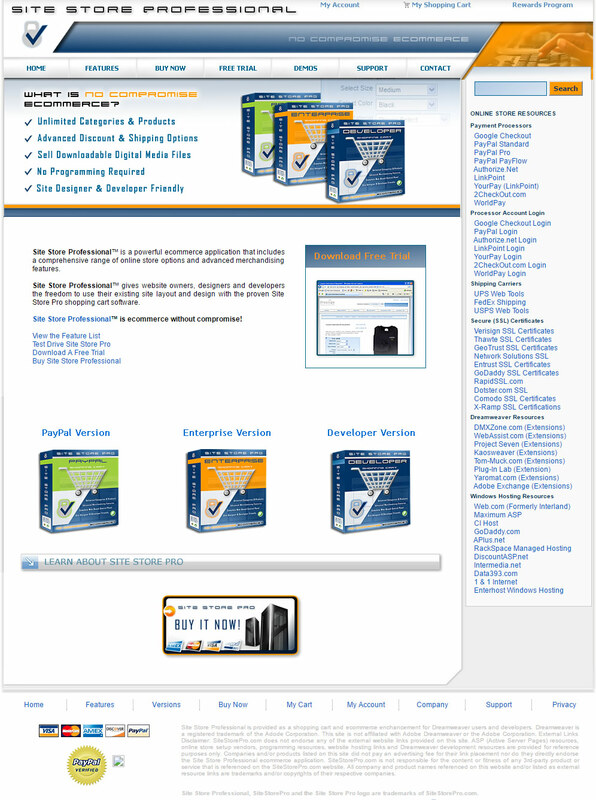 The branding on this design was not a great success since many users thought the “Dell” like server grid background and various images of servers around the site didn’t fit into the overall mission of Site Store Pro. (Many users thought we were a hosted cart solution and not a self-hosted cart due to the “server” theme). We also changed our corporate logo with this site launch for the first time since the company was founded in 2005. Feedback on the new logo’s design was luke-warm. The consensus view of the new logo was that it was “blah” so we replaced it with a snazzier logo exactly one year later. Even though we had been a PayPal approved Partner for years, this was the first design where we actually promoted that status. Site width was fluid since it was a responsive design. (Max width 1070 pixels). To coincide with the launch of our WordPress shopping cart plugin (WPCartPro), we decided to launch our own site in WordPress for the first time. The site ran the WPCartPro plugin and was skinned using the AccessPress Ray Theme. It was an extremely difficult decision not to use Dreamweaver for our own site design and management. After all, we live, breathe and promote Dreamweaver! Since we have always been, and still are, primarily a Dreamweaver-based shopping cart, we were all very conflicted at the thought of abandoning our bread-and-butter design environment and using WordPress on our own site. On our first WP themed site, we toned down the server (hardware) images and only kept the “server grid” header background image from the previous design and the server images on one slide on the home page. We also launched our new (and current) logo to replace the logo redesign from a year earlier. In hindsight, launching a WordPress site alongside the WPCartPro shopping cart launch was a very tough decision by the company principles but the right thing to do. We needed to show our customers that both platforms (WordPress and Dreamweaver) are both equally suitable to use and run our shopping cart. Site width was fluid since it was a responsive design. (Max width: 1200px). The current site uses WordPress for content management, our WPCartPro plugin for the shopping cart and the Enigma WP Theme by Weblizer. Now that the WPCartPro cart has been out for a while, we debated on whether or not to switch back to a Dreamweaver-based design. However, our lead designer convinced us to stick with WordPress for another site version and we are very pleased with what he and his team created with the latest design. They also made tons of updates on the content pages. Many of the general info pages had not been revised in quite a long time. The new site contains much more information on the different cart versions plus a streamlined KB | Support area. We hope you enjoyed this look back into the history of SiteStorePro.com! Although our main focus has always been and will always be, supporting our customers and developing new features for the shopping cart, we will try to stay current with our own site design as well. We are constantly amazed by how you use our cart solutions on your own websites and how you promote your brand using our products and services. Thank you for the last 10+ years and we will continue to evolve on our end to meet and exceed your e-commerce requirements. Enjoy our latest “new” site design… who knows when we will be replacing it with the next big thing in web-design!